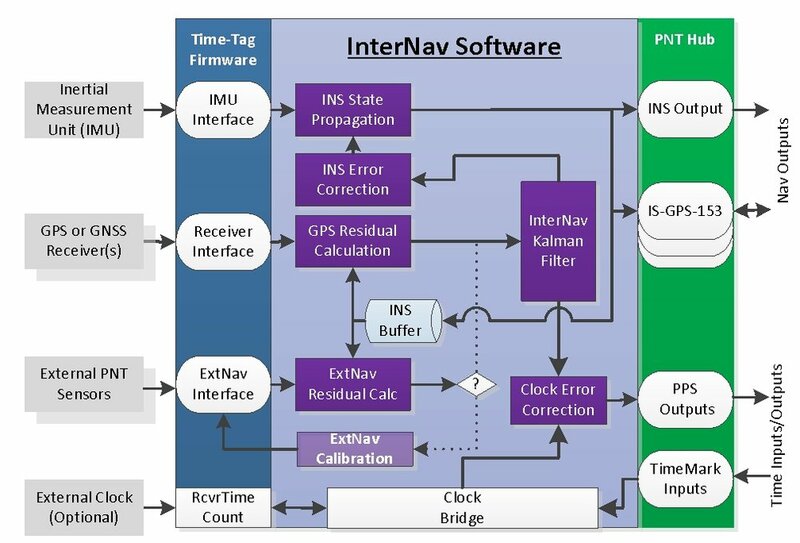 Open architecture navigation software product for integration of inertial, GPS, and other navigation- aiding sensors to provide assured positioning navigation and timing (PNT). Open architecture software with interface source code and analysis tools for integrating GPS, inertial, and other aiding sensors on a VxWorks, Linux, or Windows computer. Open architecture software and firmware reference design implemented on Xilinx’s FPGA/ARM “Zynq SoC” platform with reference design for customers to embed PNT capability into their products using GPS, inertial, and other aiding sensors. Provides a plug and play capability for integration of IMUs, GPS receivers, and other PNT-aiding sensors using the InterNav SoC software and firmware to develop and test Assured PNT solutions. 08-09-006 - Near Real-Time Geo-Referenced UAV Imagery Collection and Web-Based Processing on a Server for Targeting and Mapping. 07-11-001 - Constrained Beamforming for Space GPS Navigation. 07-09-002 - An Integrated Software Defined Radio Navigation System for Space. 07-09-001 - Constrained Beamforming for Space GPS Navigation. 04-09-002 - Precision Maritime Inshore Navigation with a Tightly-Coupled Sensor System. 04-09-001 - Performance Test Results on an Integrated GPS/MEMS Inertial Navigation Package. 02-01-002 - High Accuracy Autonomous Image Georeferencing Using a GPS/Inertial-Aided Digital Imaging System. 99-06-003 - Precision Targeting Using GPS/Inertial-Aided Sensors.